Earlier this year, our friends at Southern Appalachian Mountain Stewards celebrated a major victory. The long campaign to defeat the Ison Rock Ridge mountaintop removal mining permit in Southwest Virginia came to an end after Jim Justice’s A&G Coal Corp. did not appeal a decision by the Virginia Department of Mines, Minerals and Energy to deny the permit. The now-defeated Ison Rock Ridge mine would have destroyed approximately 1,200 acres in Wise County, Va. 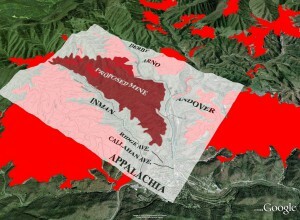 The mine site would have threatened five communities: Inman, Andover, Arno, Derby and the Town of Appalachia. And the ridge itself is one of the last areas surrounding those communities that has not been destroyed by mountaintop removal. In other words, this was a huge win. Victory was won over eight years of hard work through local organizing and legal appeal — our friends at SAMS deserve a well-earned congratulations. It’s certainly time to celebrate this victory, but we can’t let our guard down just yet. While the imminent threat of mining is past, the land on Ison Rock Ridge is still owned by an absentee landholding company that’s in the business of leasing out its land to coal operators for mountaintop removal. So even though the DMME denied the permit, there’s nothing stopping A&G Coal or another company from submitting an application to mine the threatened mountain. With coal prices in the gutter, many mines operating at a loss, and local Alpha Natural Resources’ finances in shambles, it’s unlikely that any company is racing to submit a new application. But that could change in a relatively short period of time if current market or regulatory conditions shift, which they do often. The Ison Rock Ridge victory brings us back to the complicated and perennial issue of land ownership in Appalachia. Approximately 45 percent of the land in Wise County is owned by corporate landholding entities, according the county’s economic development director, Carl Snodgrass. This isn’t a new development, and it’s not unique to coal-bearing counties in Appalachia. Still, much of our region’s resource-rich land was snatched up in the decades after the Civil War when coal reserves were first being discovered and mined. Ever since, companies whose only interest is to make as much money as possible by extracting the region’s natural resources have had control. So while the issue of outside land ownership is nothing new, there’s an increasing number of people, including some elected officials, who are starting a renewed call for land reform. The growing movement for economic diversification across Appalachia is creating the space for public discussion of this and other hard questions. And as more and more localities see the light of diversification, there will be a groundswell of citizens and leaders throughout the mountains calling for land reform. Stay up to date. Subscribe to The Front Porch Blog.